– Chelsea vs PSG: They acted like ‘babies’ at Stamford Bridge – Zlatan Ibrahimovic. – John Terry defends Chelsea over Zlatan Ibrahimovic’s ‘babies’ jibe. 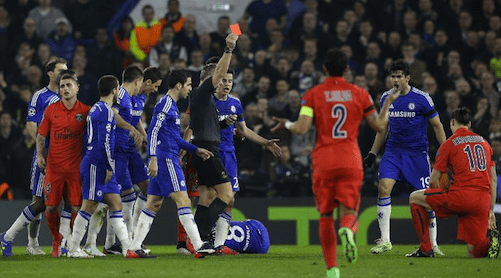 – Chelsea underperform against 10-man PSG. Final Score 2 – 2 (Aggregate: 3-3). Chelsea’s players acted like “babies” during the incident that led to Zlatan Ibrahimovic’s red card on Wednesday, the Paris St-Germain striker says. The Swede was sent off for a tackle on Oscar after 31 minutes but PSG survived the last hour of normal time and extra time to knock Chelsea out of the Champions League last 16 on away goals. “When I got the red card all the Chelsea players come around,” he said. Blues players surrounded Dutch referee Bjorn Kuipers following Ibrahimovic’s lunging tackle on Brazilian midfielder Oscar. “I don’t know if I have to get angry or start to laugh. For me when I saw the red card I was like ‘the guy doesn’t know what he’s doing’,” the PSG forward added. 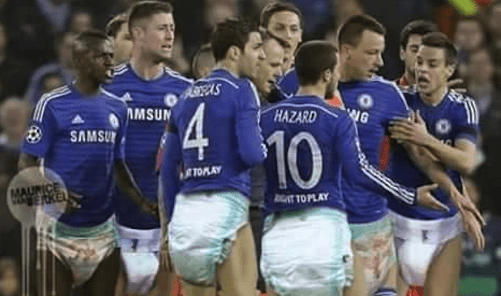 However, Chelsea’s captain, John Terry has defended Chelsea’s conduct during their Champions League defeat to Paris St-Germain after Blues players were accused of being “babies”. Terry insisted the actions of the Chelsea players were justified because PSG had done the same thing. “Once they’re charging the ref, the only thing we can do is respond,” said the former England defender, 34. “You can’t let them surround the ref, trying to get our players booked. “If I have to run 20, 30 yards, it doesn’t look great, but when you’re standing back and seeing five or six of their players surrounding the ref, I think I support my team-mates. And once I go, four or five go with me.